I found this article to be of interest and wanted to understand it. I have added to it the cleaned-up results of a “Google translate” rendition. I hesitate to call it a translation, as its editor has only a couple semesters of German and not very much practice. Even a hatchet job with a short text like this leaves me with enormous respect for the work done by translators. 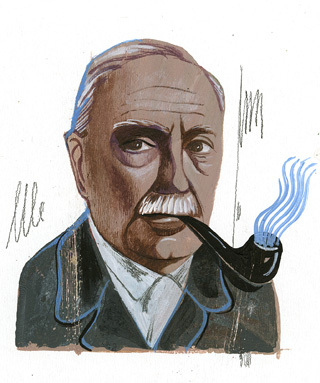 In summary, Bultmann finds that Romans 7:25b, Romans 8:1, Romans 10:17, Romans 2:1, and Romans 13:5 are marginal notes that intend to summarize the train of thought developed by Paul in brief “sententious” (doctrinal, pithy, gnomic) form, drawn into the body of the text. They may or may not come from a common “Glossator.” Bultmann further finds that Romans 2:16 and 6:17b seem similarly secondary but are simply interpolations, not marginal notes, with the “Editor” that also added the doxology a likely author. Romans 7:25b. So then, I myself serve the law of God with my mind, but with my flesh I serve the law of sin. Romans 10:17. So faith comes from hearing, and hearing through the word of Christ. Romans 2:1. Therefore you have no excuse, O man, every one of you who judges. For in passing judgment on another you condemn yourself, because you, the judge, practice the very same things. Romans 13:5. Therefore one must be in subjection, not only to avoid God’s wrath but also for the sake of conscience. Romans 2:16. on that day when, according to my gospel, God judges the secrets of men by Christ Jesus. Romans 6:17b. … you obeyed from the heart that pattern of teaching you were entrusted to. The German text follows the English rendition below. In Zeitschrift für die Neutestamentliche Wissenschaft 40 (1941), pp 249-254, Friedrich Müller carefully and ingeniously analyzed the reasoning of Rm 7, 22 – 8.3 and 10, 13-15, and came to the result, that the verses now standing there were once written as an addendum in the margins – mind you, in the original version, not later on by a scribe [glossator] – and were then placed properly. The thesis that verse 25 b is a secondary gloss is not new, so Müller’s analysis has led to the realization that 8, 1 is also an exegetical gloss. By ἄρα νῦν [therefore now] the sentence (as well as 7, 25 b by the ἄρα οὖν [then so]) is intended as a consequence of the foregoing and therefore cannot follow the χάρις τῷ θεῷ κτλ of 7, 25 a [Thanks be to God, etc. ], which on the contrary requires an explanation. This justification is actually given in verse 8, 2, and 8, 2 must be connected to 7, 25 a. Now it would not be impossible for 8, 1 to follow after 8, 2, as Müller suggests. However, it seems to me that the connection between 8, 2 and 8, 3 is fixed: the ὁ γὰρ νόμος τοῦ πνεύματος … ἠλευθἑρωσέν σε ἀπὸ τοῦ νόμου τῆς ἁμαρτίας καὶ τοῦ θανάτου [For the law of the Spirit … has set you free from the law of sin and death] (verse 2) because ὁ θεός … κατέκρινεν τὴν ἁμαρτίαν ἐν τῇ σαρκὶ [God … condemned sin in the flesh]. This nexus must not be torn. Also, with the salvation of ταλαίπωρος ἄνθρωπος [wretched man] as the conclusion of 7, 15-23, the statement that there is no κατάκριμα [condemnation – 8:1] found in Christ Jesus is, at least, not very appropriate. For salvation, in the context after verse 24, is not from conviction in court, but from σῶμά τοῦ θανάτου τούτου [this body of death] and from the control of the νόμος τῆς ἁμαρτίας … ἐν τοῖς μέλεσιν [law of sin … in the members]. So probably 8, 1 just as 7, 25 b must represent exegetical commentary. Both glosses attempt to have Paul’s remarks in 7: 15-23 and 7, 25a; 8, 2. 3 summarized to express points of doctrine drawn from the text or dogmatic principles; both are characteristically formulated as conclusions. 2. It is the same with 10, 17, where again the characteristic ἄρα [then] appears before a doctrinal summary of what verses 14 and following introduce. Müller has it absolutely right that 10, 17 is in the wrong place in the text and a marginal note to verse 15 has changed place – except that the marginal note should be considered that of a scribe [glossator]. But the same judgment does not, in my opinion, fall upon verse 15b (καθάπερ κτλ. [just as, etc. ]), which Müller also takes for a marginal note, which would have been added after verse 14. But why? The quote in verse 15 b is surely not, as Müller says, following Lietzmann, “just an ornamental praise of evangelical calling”; an occurrence of this kind would have found a better place behind verse 14. But with Lagrange and others, the citation will be regarded as scriptural proof, as otherwise established by καθάπερ [just as] citations in Paul. It explains (i.e., supersedes) the rhetorical question πῶς δὲ κηρύξωσιν ἐὰν μὴ ἀποταλῶσιν; [And how are they to preach unless they are sent?] with the obvious answer: the required ἀποσταλῆναι [sending] has occurred because Isaiah had already prophesied about sending the messenger. This is even more evident when Paul the ὡραῖοι [beautiful] in the original and always lively sense of “timely,” understood as “at the right time, conforming.” Anyway, the quote has its proper place with verse 15a behind it, so there is no reason to make it a marginal note – whether of Paul or a scribe [glossator] – rearranged, i.e., placed on the side. If you are brought by such cases to observe that such doctrinal phrases that summarize briefly the meaning of Paul’s remarks and bring them into the form of a dogmatic proposition in the text can be identified as marginal notes, it will be asked whether the same facts obtain in other cases where such doctrinal summaries are encountered, even if they do not thereby reveal themselves as glosses because they interfere with the train of thought. You will of course need to be careful and avoid denying any doctrinal formulation to Paul or viewing any ἄρα [then] (οὖν [so]) as an indicator of a gloss. No one will doubt the ἄρα οὖν [then so] of Rm 5, 18; 7, 3; 8, 12; 9, 16, 18 as well as Gal 6, 10; 1 Th 5, 6 are original Pauline expressions. And if they wanted to ask about whether Rm 14, 12 and 19 are glosses, then that would be very vague and not really be explained by conjecture. And the doctrinal character of Rm 9, 16 brings the verse in little suspicion to be a gloss, and similarly that of Gal 6, 7-8. See, e.g., Jülichers’ Introduction and Lletzmanns in the 1st ed. of his commentary. I see that even Karl Barth understands that. Whether older exegetes have I can not tell. 1. However, there are two cases in which such suspicions appear to me to be well founded, first Rm 2, 1. Each exegete knows what creates the difficulty with the διό [wherefore] with which the verse begins, but there really can be no solution from what has gone before. What attempts have been made to explain this διό [wherefore]! – Until its cancellation in a “colorless control gauge particle [Übergaugspartikel]”, or until conjugation change in δὶς. All the difficulties disappear when investigating the verse as a gloss, which will summarize the meaning of verses 2 f., and the consequence drawn from verse 3. We see then: verse 1 actually belongs behind verse 3: the ὦ ἄνθρωπε ὁ κρίνων [O man, without excuse] is explicitly given in the commentary, by the addition of πᾶς [every], the sense of a universal set, and the διό [wherefore] is the answer to the rhetorical question of verse 2, which happens to be given as, “No!”. The connection of 2, 2 to 1, 32 now turns out to be an excellent: while the τοιαῦτα [such-like] still πράσσοντες [practice] and are winning applause second to none, we know that God’s judgment is imposed on them. When in fact οἴδαμεν δὲ [we know however] strictly speaking does not fit well after verse 1, it further comes to light that δέ [however], in the plural, testifies that γάρ [for] was changed so that σεαυτὸν κατακρίνεις [you condemn yourself] in verse 1 receives a justification, – an unnecessary one, of course, since τὰ γὰρ αὐτά πράσσεις ὁ κρίνων [because you who pass judgment do the same things] is already its basis. I have suspected πᾶς ὁ κρίνων [all without excuse] in verse 1 for a long time; in exchange with Ernst Fuchs, who expressed the idea first, I realized that 2, 1 can only be a gloss. 2. As in verse 7, 25b; 8, 1; 10, 17, the gloss is introduced by ἄρα [then] (οὖν [so] or νῦν [now]), as analogous to 2, 1 by διό [wherefore]. It seems to me that this is also the case in 13, 5. It can not be denied that διὰ τοῦτο γάρ in verse 6 on the set of verse 4 relates: θεοῦ γὰρ διάκονός ἐστιν [for he is a minister of God] (i.e., ἡ ἐξουσία [the authority]). For verse 6 quite properly the knowledge base brings: therefore, namely, because the authority is God’s servant, you also pay taxes; because they (the authorities) are indeed God’s officials for wearing just worry. In verse 5 the διὰ τοῦτο [through this] of verse 6 can not go yes. Verse 5 is thus again an exegetical commentary, which infers from verse 4 and verse 6, and it is seen that verse 5 is actually a note to verse 6; because if it is: οὐ μόνον διὰ τὴν ὀργὴν ἀλλὰ καὶ διὰ τὴν συνείδησιν [not only because of wrath, but also for conscience’ sake], thus means: not only because the government as administrator of ὀργή [wrath] wields the sword (verse 4), but also God is used as a reason to collect taxes (verse 6); So it is not just a terror to the criminals, but also a reminder to citizens. So Lietzmann; see, particularly the extensive discussion by Einar Molland, Serta Rudbergiana, Oslo 1931, pp 44-52. I note in this connection that I believe that the συνευδοκεῖν [approving] 1, 32 referse the applause, such as to acts of comedy and mime, perhaps also given in the circus. part 1, the factual ποιεῖν τὰ τοῦ νόμου [practice the law], which is also discussed in Heiden, and part 2, the phenomenon of conscience. If you do not want to understand μεταξὺ ἀλλήλων κατηγοροῦντες ἡ καὶ ἀπολογούμενοι λογισμοί [their thoughts sometimes accusing them and at other times even defending them] as a description of the phenomenon of conscience, but instead as the discussion of moral issues in the pagan society, which I think is very questionable, further consider as part 3, precisely this discussion. In any case, the proof is by referring to indisputable facts of the present. It is thus such that verse 15 speaks of the present and verse 16 of the future, so all that remains is the ability to add an intermediate thought between verse 15 and verse 16: “time will tell on that day. .. “(Jülich, Althaus). But is this supplement really so simple and easy to perform? And does it really eliminate the offense? What meaning would it have to tell anyone nearby about the ordinary phenomena of the present, as evidence regarding the day of judgment? is due to the stupid intermediate block: ὑπηκούσατε δὲ ἐκ καρδίας εἰς ον παρεδόθητε τύπον διδαχῆς [you became obedient from the heart to that form of teaching to which you were committed], a sentence that disturbs the context and contains two non-Pauline turns, ἐκ καρδίας [from the heart] and τύπος διδαχῆς [form of teaching]. The exegetes are again plunged into excruciating efforts, regarding what is meant τύπος διδαχῆς [form of teaching] from the viewpoint of Paul’s understanding, while it is quite clear that the scribe [glossator] writes about specifically Pauline doctrine. To be sure, for anyone who does not feel that in section 6, 15-23 the great development of the dialectic between ἐλευθερία [freedom] on the one hand, and ὑπακούειν [obedience] or to δοῦλος εἶναι [become a slave] on the other hand, is corrupted by the trivial ὑπακούειν [obedience] to the τύπος διδαχῆς [form of teaching], any other reasoning is not going to be of much help. Whether all the glosses that were discussed in the foregoing, go back to one and the same Glossator, I will leave undecided. Of the cases mentioned in the first two sections, it seems very likely to me. Those in the third section have a different character; they are interpolations in the proper sense, not marginalia wanting to provide a short formula to bring the content of a thought process into doctrinal form. So these are likely to have other origins and perhaps come from the Editor, who has added the final doxology in 16-25-27, where you also find κατὰ τὸ εὐαγγέλιον μου [according to my gospel] as in 2, 16. In der Zeitschrift für die Neutestamentliche Wissenschaft 40 (1941), S. 249-254, hat Friedrich Müller sorgfältig und scharfsinnig den Gedankengang der Abschnitte Rm 7, 22 – 8,3 und 10, 13-15 analysiert und ist zu dem ergebnis gekommen, daß die jetzt verstellten Verse einst als Nachtrag an den Rand geschrieben waren – wohlgemerkt: schon im Original, nicht etwa erst nachträglich von einem Glossator -, und dann falsch eingeordnet wurden. Aber wie ist dann der textgeschichtliche Vorgang zu verstehen? Ist etwa das Konzept des Briefes mit den Korrekturen von Paulus an die römische Gemeinde geschickt worden? Das dünkt mich wenig wahrscheinlich. So richtig mir M.’s Analyse des Textes zu sein scheint, und so sehr ich ihm darin zustimme, daß Randbemerkungen an falscher Stelle in den Text geraten sind, – die Frage nach dem Zustandekommen des vorliegenden Textes scheint mir doch eine andere Antwort zu verlangen. Ist die These, daß V. 25 b eine sekundäre Glosse ist, nicht neu1, so hat mich M.’s Analyse eitergeführt zu der Erkenntnis, daß auch 8, 1 eine exegetische Glosse ist. Durch das ἄρα νῦν gibt sich der Satz (ebenso wie 7, 25 b durch das ἄρα οὖν) als Folgerung aus dem Vorausgehenden und kann deshalb nicht auf das χάρις τῷ θεῷ κτλ 7, 25 a folgen, das vielmehr selbst eine Begründung verlangt2. Diese Begründung wird in 8, 2 tatsächlich gegeben, und 8, 2 muß sich an 7, 25 a anschließen. Nun wäre es nicht unmöglich, 8, 1 auf 8, 2 folgen zu lassen, wie M. vorschlägt. Indessen scheint mir die Verbindung von 8, 2 und 8, 3 eine feste zu sein: das ὁ γὰρ νόμος τοῦ πνεύματος … ἠλευθἑρωσέν σε ἀπὸ τοῦ νόμου τῆς ἁμαρτίας καὶ τοῦ θανάτου (V. 2) wird durch das ὁ θεός … κατέκρινεν τὴν ἁμαρτίαν ἐν τῇ σαρκὶ begründet. Dieser Nexus darf nicht zerrissen werden. Auch ist als Ergebnis der Befreiung des ταλαίπωρος ἄνθρωπος von 7, 15—23 der Satz, daß es für die in Christus Jesus Befindlichen kein κατάκριμα gebe, zum mindesten nicht sehr treffend. Denn die Errettung, nach der V. 24 ausschaut, ist nicht die von der Verurteilung im Gericht, sondern die vom σῶμά τοῦ θανάτου τούτου und d. h. von der Macht des νόμος τῆς ἁμαρτίας … ἐν τοῖς μέλεσιν. Also dürfte 8, 1 wie 7, 25 b eine exegetische Glosse sein. Beide Glossen wollen das Ergebnis der paulinischen Ausführungen 7, 15—23 bzw. 7, 25a; 8, 2. 3 zusammenfassen zu gleichsam aus dem Text abstrahierten sentenziösen oder dogmatischen Sätzen; beide sind charakteristisch formuliert als Folgerungen. 2. Ebenso steht es mit 10, 17, wo wieder das charakteristische ἄρα erscheint, um eine sentenziöse Zusammenfassung von V. 14f. einzuführen. M. hat darin völlig Recht, daß 10, 17 eine an falscher Stelle in den Text geratene Randbemerkung ist, die eigentlich hinter V. 15 ihren Platz haben sollte, — nur daß die Randbemerkung die eines Glossators sein dürfte. Das gleiche Urteil ist aber m. E. nicht über V. 15b (καθάπερ κτλ.) zu fällen, den M. ebenfalls für eine Randbemerkung hält, die hinter V. 14 einzufügen wäre. Aber warum ? Das Zitat V. 15 b ist doch gewiß nicht, wie M. nach Lietzmann meint, ein “nur ornamentales Lob des Evangelistetiberufes”; ein solches würde freilich seinen Platz allenfalls besser hinter V. 14 haben. Aber mit Lagrange und anderen wird das Zitat als Schriftbeweis aufzufassen sein wie sonst die mit καθάπερ eingeführten Zitate bei Paulus. Es begründet (bzw. ersetzt) die auf die rhetorische Frage πῶς δὲ κηρύξωσιν ἐὰν μὴ ἀποταλῶσιν; selbstverständliche Antwort: das erforderliche ἀποσταλῆναι hat stattgefunden; denn schon Jesaja hat die Entsendung der Boten geweissagt. Das ist um so deutlicher, wenn Paulus das ὡραῖοι in dem ursprünglichen und immer lebendigen Sinn von “rechtzeitig,” “zur rechten Zeit sich einstellend” verstanden hat3. Jedenfalls hat das Zitat hinter V. 15 a seinen richtigen Platz, so daß kein Grund vorliegt, es als eine Randbemerkung — sei es des Paulus, sei es eines Glossators — umzustellen bzw. auszuscheiden. Ist man durch solche Fälle darauf aufmerksam geworden, daß derartige sentenziöse Sätze, die den Sinn paulinischer Ausführungen knapp zusammenfassen wollen und ihn in die Form eines dogmatischen Lehrsatzes bringen, in den Text eingedrungene Randbemerkungen sein können, so wird man fragen, ob der gleiche Tatbestand nicht auch in anderen Fällen vorliegt, wo solche Sätze begegnen, auch wenn sie sich nicht dadurch als Glossen verraten, daß sie den Gedankengang empfindlich stören. Man wird freilich vorsichtig sein müssen und nicht etwa jede sentenziöse Formulierung dem Paulus absprechen oder jedes ἄρα (οὖν) als Index einer Glosse ansehen. Niemand wird zweifeln, daß das ἄρα οὖν Rm 5, 18; 7, 3; 8, 12; 9, 16. 18 ebenso gut ursprünglich paulinisch ist wie Gl 6, 10; 1. Th 5, 6. Und wollte man etwa fragen, ob Rm 14, 12. 19 Glossen sind, so wäre das eine ganz vage, nicht wirklich zu begründende Vermutung. Und der sentenziöse Charakter von Rm 9, 16 bringt den Vers so wenig in den Verdacht, eine Glosse zu sein, wie etwa der von Gl 6, 7t. Vgl. z. B. Jülichers Erklärung und die Lletzmanns In der 1. Aufl. seines Kommentars. Ich sehe, daß auch Karl Barth so versteht. Ob auch ältere Exegeten, habe Ich nicht feststellen können. 1. Es gibt jedoch zwei Fälle, in denen mir ein solcher Verdacht als begründet erscheint, zuerst Rm 2, 1. Jeder Exeget weiß, welche Schwierigkeit das διό macht, mit dem der Vers beginnt, der doch wirklich keine Folgerung aus dem Vorausgehenden sein kann. Welche Versuche sind gemacht worden, um dieses διό zu erklären! — bis zu seiner Entwertung zu einer “farblosen Übergaugspartikel”1, oder bis zur konjizierenden Änderung in δὶς2. Alle Schwierigkeiten verschwinden, wenn man den Vers als Glosse aushebt, die den Sinn von V. 2 f. zusammenfassen will, bzw. die Konsequenz aus V. 3 zieht. Man sieht dann: V. 1 gehört eigentlich hinter V. 3: dem ὦ ἄνθρωπε ὁ κρίνων wird in der Glosse durch den Zusatz des πᾶς der Sinn eines allgemeingültigen Satzes ausdrücklich gegeben, und das διό folgert aus dem auf die rhetorische Frage von V. 2 selbstverständlich zu gebenden “Nein!”. Der Anschluß von 2, 2 an 1, 32 stellt sich nun als ein ausgezeichneter heraus: während den τοιαῦτα πράσσοντες noch Beifall gespendet wird von Ihresgleichen3, wissen wir doch, daß Gottes Gericht über sie verhängt ist. Daß in der Tat das οἴδαμεν δὲ . . . genau besehen hinter V. 1 nicht gut paßt, kommt darin zutage, daß das δέ in das mehrfach bezeugte γάρ geändert wurde, damit das σεαυτὸν κατακρίνεις von V. 1 eine Begründung erhält, — eine unnötige freilich, da es durch das τὰ γὰρ αὐτά πράσσεις ὁ κρίνων schon begründet war. Mir war seit langem das πᾶς ὁ κρίνων in V. 1 verdächtig gewesen; im Austausch mit Ernst Fuchs, der den Gedanken zuerst äußerte, wurde mir klar, daß 2, 1 nur eine Glosse sein kann. 2. Wie in 7, 25b; 8, 1; 10, 17 die Glosse durch ἄρα (οὖν bzw. νῦν) eingeführt ist, so analog in 2, 1 durch διό. Mir scheint, daß das in 13, 5 ebenso der Fall ist. Es läßt sich doch nicht leugnen, daß sich das διὰ τοῦτο γάρ V. 6 auf den Satz von V. 4 bezieht: θεοῦ γὰρ διάκονός ἐστιν (sc. ἡ ἐξουσία), für den V. 6 ganz sachgemäß den Erkenntnisgrund bringt: deshalb, nämlich weil die Behörde Gottes Dienerin ist, zahlt ihr ja auch Steuern; denn sie (die Behörden) sind ja Gottes Beamte, die eben dafür Sorge tragen. Auf V. 5 kann das διὰ τοῦτο von V. 6 ja nicht gehen. V. 5 ist also wiederum eine exegetische Glosse, die aus V. 4 und V. 6 folgert, und zwar ist V. 5 genau genommen eine Anmerkung zu V. 6; denn wenn es lautet: οὐ μόνον διὰ τὴν ὀργὴν ἀλλὰ καὶ διὰ τὴν συνείδησιν, so bedeutet das: nicht nur, weil die Obrigkeit als Vollstreckerin der ὀργή das Schwert führt (V. 4), sondern auch, weil sie von Gott zur Erhebung der Steuern eingesetzt ist (V. 6); sie bedeutet also nicht nur einen Schrecken für den Verbrecher, sondern auch eine Mahnung für den Bürger. So Lietzmann; vgl. besonders die ausführliche Diskussion durch Einar Molland, Serta Rudbergiana, Oslo 1931, S. 44—52. Anton Fridrlchsen, Symb. Arct. (bzw. Osl.) I 1922, 40. Ich bemerke bei dieser Gelegenheit, daß Ich glaube, daß das συνευδοκεῖν 1, 32 auf den Beifall geht, der solchen Taten in der Komödie und im Mimus, vielleicht auch Im Zirkus gespendet wird. gehört 1. das faktische ποιεῖν τὰ τοῦ νόμου, das auch bei Heiden vorkommt, 2. das Gewissensphänomen. Falls man die μεταξὺ ἀλλήλων κατηγοροῦντες ἡ καὶ ἀπολογούμενοι λογισμοί nicht als Beschreibung des Gewissensphänomens, sondern als die Diskussion über moralische Fragen in der heidnischen Gesellschaft verstehen will, was ich für sehr fragwürdig halte, käme dazu noch 3. eben diese Diskussion. In jedem Falle aber wird der Beweis durch den Hinweis auf unbestreitbare Tatsachen der Gegenwart geführt. Steht es aber so, daß V. 15 von der Gegenwart und V. 16 von der Zukunft redet, so bleibt nur noch die Möglichkeit, zwischen V. 15 und V. 16 einen Zwischengedanken zu ergänzen: “das wird sich zeigen an jenem Tage . . .” (Jülicher, Althaus). Aber ist diese Ergänzung wirklich so einfach und leicht zu vollziehen ? Und beseitigt sie wirklich den Anstoß ? Welchen Sinn soll es denn haben, von einem jedermann sichtbaren Phänomen der Gegenwart zu sagen, daß er sich am Tage des Gerichtes offenbaren werde ?! ist durch den stupiden Zwischensatz: ὑπηκούσατε δὲ ἐκ καρδίας εἰς ον παρεδόθητε τύπον διδαχῆς empfindlich gestört, durch einen Satz, der gleich zwei unpaulinische Wendungen enthält, das ἐκ καρδίας und das τύπος διδαχῆς. Die Exegeten werden wieder in quälende Bemühungen gestürzt, was vom Blickpunkt des Paulus aus unter dem τύπος διδαχῆς zu verstehen sei, während es völlig klar ist, daß der Glossator die spezifisch paulinische Lehre meint. Freilich: wer nicht empfindet, daß in dem Abschnitt 6, 15—23 die großartige Entfaltung der Dialektik der ἐλευθερία einerseits, des ὑπακούειν bzw. des δοῦλος εἶναι andererseits durch das triviale ὑπακούειν gegenüber dem τύπος διδαχῆς verdorben wird, dem wird mit anderen Gründen nicht mehr viel zu helfen sein. Ob sämtliche Glossen, die im Vorangegangenen besprochen wurden, auf einen und denselben Glossator zurückgehen, will ich dahingestellt sein lassen. Von den in den beiden ersten Abschnitten behandelten ist es mir sehr wahrscheinlich. Die im dritten Abschnitt behandelten haben anderen Charakter; sie sind Interpolationen im eigentlichen Sinn, keine Randbemerkungen, die in sentenziöser Form den Gehalt eines Gedankengangs auf eine kurze Formel bringen wollen. Sie dürften also auch anderen Ursprungs sein und stammen vielleicht von dem Redaktor, der die Schluß-Doxologie 16, 25—27 hinzugefügt hat, in der auch jenes κατὰ τὸ εὐαγγέλιον μου von 2, 16 begegnet.